Many new entrepreneurs would not be able to define what a ‘merchant account’ is. Not understanding what a merchant account is, is nothing to be embarrassed by. There are plenty of established business professionals who have been in the field before merchant services became a crucial part in day to day transactions. A lot of them are still not completely sure about the services that merchant service providers fully offer. There are many merchant service providers out there, each with their own plethora of credit card processing machines. North American Bancard, one of the leaders in the merchant service industry, offers a variety of options from standard telephone line terminals to the most advanced smartphone processors. What a lot of businessmen don’t know is that there are a few things needed in order to accept credit cards. 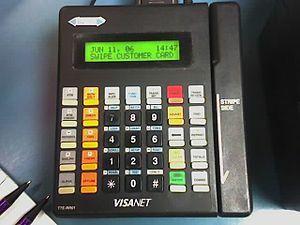 Obviously you need some sort of connection to the internet or a phone line, and a terminal to swipe the card; but most do not know that you also need a merchant account. If you are getting confused with this than you are probably a business that does not currently accept credit cards. If you’re not accepting them you’re losing out on sales and giving your customers a spending budget. In today’s society, a digital one, about half of sales are paid for via a credit/debit card. By not accepting credit cards you are not only losing out on sales, you are stopping your customers from spending an infinite amount of money in your store since they are limited to the cash they have on hand. For those businesses that have gone viral, an internet merchant accounts provider is essential. Having one will increase the amount of business received, as customers will be able to purchase goods from the comfort of their homes. When contacting a B2B credit card processing service provider there is several aspects a business needs to consider. Obviously fees are one of the most important aspects. It is important to look at the fine print to see what the fees are for things such as, processing fee, monthly fees, and cancellation fees. Secondly, and almost as equally important, is the customer service that merchant service provider offers. This is especially crucial for first time users as they may come across questions or have concerns in the beginning stages of credit card processing. A top rated merchant provider will offer to have a professional come to your business and set up your credit card terminal as well as walk you through on how to use it. The same applies for those who have viral sites that need a merchant account. In order for your business to blossom is this tech savvy world it is essential that it accepts credit card, as well as allow customers to purchase their goods over the internet.